Orson Welles’ bizarre film noir masterpiece The Lady from Shanghai begins with overt allusions to a fairytale and concludes in a boardwalk fun house. This is not by coincidence. The film draws from a number of narrative conventions and forms including fairytales, fables, nightmares, surrealism, film noir, and myth, and most of the film occurs on or near the water, a motif that directly represents its fluidic, hypnotic, and mirage-like qualities. The stories surrounding the film’s production have become equally legendary. The film also masterfully blends opposites such as realism and surrealism, art and reality, and dreams and consciousness. These components of the film make it one of Welles’ most aesthetically complex visions and one of the best installments in the genre of American film noir. Filmed in late 1946 and completed in early 1947, the film wasn’t released by Columbia until late 1948 and sadly disappointed most audiences. Originally titled Take This Woman and Black Irish, the film was loosely based on Sherwood King’s novel If I Die Before I Wake. William Castle, who is credited as an assistant producer and later directed the popular horror films House on Haunted Hill (1958) and 13 Ghosts (1960), originally owned the rights to the book. Castle also contributed to some of the script. The film was shot in Columbia’s studios and on location in Acapulco, Mexico and San Francisco. The latter location contributed memorable scenes at the Sausalito waterfront, the Valhalla Bar and Cafe, Chinatown, the Steinhart Aquarium in Golden Gate Park, and Whitney’s Playland amusement park. Welles directed, wrote, and produced the film and is also its protagonist. His bravura performance was conducted against a profoundly challenging backdrop. By the mid-1940s, Welles had already essentially been blacklisted in Hollywood long before the term became fashionable and connected to McCarthyism. RKO Studios, which released Citizen Kane (1941) and The Magnificent Ambersons (1942), worked hard to brandish Welles as an overrated wunderkind. He had been labelled throughout Hollywood as a lavish filmmaker whose services were not always worth their investment. Large chunks of his films were often left on the cutting-room floor, as was the case with The Magnificent Ambersons (and later, to a lesser degree, Touch of Evil, his other legendary noir masterpiece). Unfortunately, The Lady from Shanghai was no exception. Approximately 60 minutes of it have been removed from Welles’ original version, which is one reason why the narrative is at times awkwardly surreal and confusing. Another reason for the film’s schizophrenic feel is because three distinct cinematographers worked on it, two of whom were Hollywood legends: Charles Lawton Jr. and Rudolf Mate. Nevertheless, the film’s remaining 87 minutes represent some of the best in American art-house cinema. Ironically, interest in the film gained momentum because of Welles’ failures. Harry Cohn, Columbia’s production chief, financially supported Welles’ play Around the World in 80 Days, but it was a disaster, so Welles essentially owed Cohn a favor. Cohn’s obsession with the film’s leading lady, Rita Hayworth, who was still married to Welles during the shooting, also lured his support. In fact, Cohn reportedly hoped the film would bring him and Hayworth together. It never did, although Cohn did exhaust his resources to preserve Hayworth’s reputation, which he believed was damaged due to Welles’ casting of her in the role of a femme fatale and then tampering with her legendary hair. In fact, Welles and Hayworth staged a circus-like media environment to announce her new hairstyle (and perhaps to anger Cohn). Reporters were allowed to witness the dramatic coiffure and deservedly wrote about it. At another point, Cohn demanded that at least one song sung by Hayworth – ultimately “Please Don’t Kiss Me” by Alan Roberts and Doris Fisher – be inserted into the film (at a cost of $60,000). Several close-ups of Hayworth were also added in post-production. The cost of Welles’ extravagant sets apparently angered Cohn as well, and by the end of the film’s production, Cohn seemed more confused than interested. He offered a reward to anyone who could explain the plot. Inevitably, this tug-of-war between Welles and Cohn added layers of creative tension that ultimately fuelled the film’s overall mise-en-scène. The fading marriage between Welles and Hayworth offered another challenge to the film’s production. Many critics argue that although the film reeks of grandiose surrealism, the unique tension between the couple offers an unusually effective level of verite to the film. Their divorce papers were made official in November 1947, which makes the stress of their on-screen relationship very real. Hayworth and Welles had a mutual respect for each other, and were cordial after their breakup. Several individuals associated with the film have attested that their off-camera interactions during the production were generally warm. Some have even said they addressed each other on the set as “mama” and “papa”. Perhaps the greatest challenge to the film’s production was the physical health of the cast and crew. The boat, titled in the film as Circe, was owned by film legend Errol Flynn, who allegedly captained it drunkenly during the filming. A camera assistant died on the first day of shooting, and one legend suggests that Flynn wanted the body dumped into the ocean in a duffel bag. Instead, the crew placed the body ashore on the Mexican coast and hushed the incident up. Welles was bitten by an insect and saw his eye swell to epic proportions. And Hayworth was sick throughout the shoot due to a nervous condition and sinus problems. At one point she became so sick that Welles shut down production for a month. The Lady from Shanghai is adroitly punctuated by many of the genre’s conventions, and viewers will be hard pressed to find a more impressive and thorough film noir. Through O’Hara’s voiceover, we recognise immediately that he knows Elsa is seducing him and making him the fool. His foreboding narration bleeds with a brooding sense of fatalism, and although he is powerless for most of its duration, the one un-noir-like quality of the film is the fact that he does ultimately overcome his transgressions and foolish decisions. Nevertheless, his voiceover is underlined by a melodramatic nostalgia. Elsa is splendid as the femme fatale, revealing very little about her intentions and duplicity but often revealing much of her body to O’Hara. As a former “lady of the night”, Elsa wisely hides her precarious Shanghai past. She speaks as much with her physical beauty as she does with her psychological angst, and her body is a vehicle for expressing this inner pain. The scenes of her bathing along the rocks during a pit stop and singing on the boat make obvious allusions to her role as a siren. Her clothing throughout the film symbollises her shifting allegiances. At times she wears white, at other times she wears black, and during other scenes she wears both. Throughout the film, she acts as the queen bee manipulating all of the film’s male characters: O’Hara, Grisby, and Bannister. Most of her machinations are conducted off-screen, which adds to her sense of mystery, allure and power. Welles forces us to imagine her craftily designed plans instead of actually seeing them. The violence of the film is more covert than anything else. Although characters are murdered on-screen, Welles excels at killing more than their on-screen images. 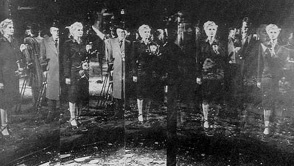 The final scene, in which Elsa and Arthur have a shootout in a room full of mirrors, suggests that not only are their bodies being terminated, but their self-images, self-esteem, and personal legacies as well. One wonders if O’Hara will be free of their haunting presences; in the film’s final voiceover, he indicates that he may have to spend the rest of his life overcoming this experience. While the visuals suggest one possibility, the voiceover narration suggests another. This dichotomy is the hallmark of The Lady from Shanghai’s paradoxical tone. Furthermore, Grisby’s paranoia about a nuclear attack is undermined when he is carted away on a stretcher; his goofy, delusional fears may have distracted him from the real danger: Elsa. Such a distraction serves as a type of ideological violence that suggests the entire political philosophy defining the Cold War may be equally distracting. Welles’ cinematography also disorients viewers throughout the film. Rarely is the camera where it should be, and many shots employ tense angles, claustrophobic or vertiginous vantage points, or chaotic compositions. The high-angle shot at the top of the yacht’s mast casts a pall of dizziness that lingers for the remainder of the film. The shots of Grisby explaining his plot to O’Hara along the coastline visually tell us that they are on the brink of death; the plan is doomed before it begins. The aquarium scenes defy logic because the distorted and overblown backgrounds, complete with abnormally large fish, reflect the dysfunctional foreground depicting a genuine love scene between the innocent and vulnerable O’Hara and Elsa, the black widow. The kangaroo court scene also shatters our expectations of any official courtroom decorum. Close-ups of people chatting and high-angle shots of judges playing chess make the entire scene a metaphor for everything the legal system is not supposed to represent: chaos, gamesmanship and frivolity. Of course, when the prosecutor cross-examines himself and O’Hara escapes by pretending to be a member of another jury, all logic is removed. The height of this ridiculous odyssey culminates in the fun house scenes, which portray in one relatively short sequence the absurdity and carnival nature of Welles’ anti-quest during the film. The Alice in Wonderland-like scenes, which were considerably shortened, are still profoundly effective in revealing what O’Hara has truly been experiencing: a nightmare at the crossroads of life and death, logic and dream, love and lust. Tragically, The Lady from Shanghai was one of Welles’ final directorial assignments in Hollywood. He directed Macbeth, which was also released in 1948, and Othello, released in 1952, but as Shakespearian dramas their crossover appeal was limited. Mr. Arkadin/Confidential Report came out in 1955 but was produced and released in Europe. He acted in a number of films during this decade of directorial hiatus, most notably 1949’s The Third Man (Carol Reed), but most of his performances as an actor have been relegated to obscurity. His reappearance as a director did not occur again until 1958, when he returned with Touch of Evil, a film noir farce that indicts the Hollywood establishment for their micro-management and commercial ways. The Lady from Shanghai was on the cutting edge of many areas including Welles’ directorial career. Nevertheless, the film is one of his best and one of the best of its kind in American cinema.